This elegant bedroom centerpiece makes a lovely and rich statement in your home. Featuring tenon and mortis construction for added strength and durability, an elegant black finish with rub through highlights, and outfitted with beautifully curved posts, which add distinction to any bed room in your home. This bed is made available in Queen and King sizes to meet the needs of your space. 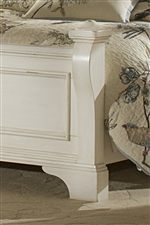 The Heirloom Queen Low Post Mansion Bed by American Woodcrafters at AHFA in the area. Product availability may vary. Contact us for the most current availability on this product. 2910-880 5/0 Interior Bolt On Rail System 1 81" 2" 7"
2910-951 5/0 Mansion Headboard 1 66" 5" 67.5"
2910-953 5/0 Mansion Footboard 1 66" 5.5" 30"
Finish & Paint Options Black with rub through. Handles & Hardware Pewter rings and escutcheons. Drawer / Shelf Construction Solid wood drawer sides and backs, with English dovetailing on front and back. Veneer drawer bottoms protect fine garments. Indonesian veneer drawer fronts. All drawers are 14 ½” deep. Drawer Suspension Center guided drawer-guides, metal-to-metal, plastic-to-plastic. Positive drawer stops ensure drawers will operate smoothly and quietly for years to come.  Description: Top All finished tops. Case Construction Tenon and Mortis construction, a centuries old method of joining two pieces of wood to provide strength and durability. The elegance and serenity you deserve, is beautifully tailored to you in the Heirloom master bedroom collection. The Heirloom's blend of traditional design and a country finish invite you to relax in refined beauty. This collection brings home graceful contours, brilliant crown rails, and gentle accents throughout. 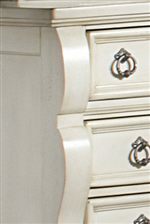 Reserve your right to the finer things in life with the gallantly placed decorative moldings, classic appeal of the pewter ring pulls and escutcheons and the subtle rub through of the masterfully blended finish throughout this collection. From the wide beveled glass landscape mirror and the triple dresser with 10 drawers to the 141/2” deep drawers in all the storage pieces and the open design of the head and footboards, this collection will never leave you feeling closed in. Thoughtful and calming the Heirloom collection is designed with snag free drawers, dust proofing on bottom drawers, and tip resistant safety brackets. The Heirloom collection is a great option if you are looking for Traditional furniture in the area. Browse other items in the Heirloom collection from AHFA in the area.